"Seahawks" redirects here. For other uses, see Seahawk (disambiguation). Seahawks fans have been referred to collectively as the "12th Man", "12th Fan", or "12s". The Seahawks' fans have twice set the Guinness World Record for the loudest crowd noise at a sporting event, first registering 136.6 decibels during a game against the San Francisco 49ers in September 2013, and later during a Monday Night Football game against the New Orleans Saints a few months later, with a then record-setting 137.6 dB. The Seahawks are the only NFL franchise based in the Pacific Northwest region of North America, and thus attract support from a wide geographical area, including some parts of Oregon, Montana, Idaho, and Alaska, as well as Canadian fans in British Columbia, Alberta and Saskatchewan. As per one of the agreed parts of the 1970 AFL–NFL merger, the NFL began planning to expand from 26 to 28 teams. In June 1972, Seattle Professional Football Inc., a group of Seattle business and community leaders, announced its intention to acquire an NFL franchise for the city of Seattle. In June 1974, the NFL gave the city an expansion franchise. That December, NFL Commissioner Pete Rozelle announced the official signing of the franchise agreement by Lloyd W. Nordstrom, representing the Nordstrom family as majority partners for the consortium. In March 1975, John Thompson, former Executive Director of the NFL Management Council and a former Washington Huskies executive, was hired as the general manager of the new team. The name Seattle Seahawks ("Seahawk" is another name for Osprey) was selected on June 17, 1975 after a public naming contest which drew more than 20,000 entries and over 1,700 names. Thompson recruited and hired Jack Patera, a Minnesota Vikings assistant coach, to be the first head coach of the Seahawks; the hiring was announced on January 3, 1976. The expansion draft was held March 30–31, 1976, with Seattle and the Tampa Bay Buccaneers alternating picks for rounds selecting unprotected players from the other 26 teams in the league. The Seahawks were awarded the 2nd overall pick in the 1976 draft, a pick they used on defensive tackle Steve Niehaus. The team took the field for the first time on August 1, 1976 in a pre-season game against the San Francisco 49ers in the then newly opened Kingdome. The Seahawks are the only NFL team to switch conferences twice in the post-merger era. The franchise began play in 1976 in the aforementioned NFC West but switched conferences with the Buccaneers after one season and joined the AFC West. This realignment was dictated by the league as part of the 1976 expansion plan, so that both expansion teams could play each other twice and every other NFL franchise once (the ones in their conference at the time) during their first two seasons. The Seahawks won both matchups against the Buccaneers in their first two seasons, the former of which was the Seahawks' first regular season victory. In 1983, the Seahawks hired Chuck Knox as head coach. Finishing with a 9–7 record, the Seahawks made their first post-season appearance, defeating the Denver Broncos in the Wild Card Round, and then the Miami Dolphins, before losing in the AFC Championship to the eventual Super Bowl champion Los Angeles Raiders. The following season, the Seahawks had their best season before 2005, finishing 12–4. Knox won the NFL Coach of the Year Award. In 1988, Ken Behring and partner Ken Hofmann purchased the team for $79 million or $99 million (both numbers have been reported). The Seahawks won their first division title in 1988, but from 1989 to 1998 had poor records; their best record in that span came in 1990, when the team finished 9–7, and the lowest point came in 1992 when the team finished with its worst record in team history, 2–14. In 1996, Behring and Hoffman transferred the team's operations to Anaheim, California, a widely criticized move, although the team continued to play in Seattle. The team almost relocated, and was in bankruptcy for a short period. The NFL threatened Behring with fining him $500,000 a day if he didn't move the team's operations back to Seattle; with this, Behring and Hoffman sold the team to Microsoft co-founder Paul Allen in 1997, for $200 million, and in 1999 Mike Holmgren was hired as head coach. He would coach for 10 seasons. The Seahawks won their second division title, as well as a wild card berth in the playoffs. In 2002, the Seahawks returned to the NFC West as part of an NFL realignment plan that gave each conference four balanced divisions of four teams each. This realignment restored the AFC West to its initial post-merger roster of original AFL teams Denver, San Diego, Kansas City, and Oakland. That same year, the team opened its new home stadium, Seahawks Stadium, after spending the last two seasons at Husky Stadium after the Kingdome's implosion in 2000. In the 2005 season, the Seahawks had their best season in franchise history (a feat that would later be matched in 2013) with a record of 13–3, which included a 42-0 rout of the Philadelphia Eagles on December 5, a game since referred to as the Monday Night Massacre. The 13-3 record earned them the number one seed in the NFC. They won the NFC Championship Game in 2005, but lost in Super Bowl XL against the Pittsburgh Steelers. The loss was controversial; NFL Films has Super Bowl XL at number 8 on its top ten list of games with controversial referee calls. Referee Bill Leavy later admitted that he missed calls that altered the game. Before 2005, Seattle had the longest drought of playoff victories of any NFL team, dating back to the 1984 season. That drought was ended with a 20–10 win over the Washington Redskins in the 2005 playoffs. In the 2009 NFL season, the Seahawks finished 3rd in the NFC West with a 5-11 record. Shortly after his first full season with the Seahawks, head coach Jim L. Mora was fired on January 8, 2010. Mora was replaced by former USC Trojans football head coach, Pete Carroll. Shortly thereafter, Mora became the head coach for the UCLA Bruins football team. In the 2010 NFL season, the Seahawks made history by making it into the playoffs despite having a 7–9 record. They had the best record in a division full of teams with losing seasons (Seahawks 7–9, Rams 7–9, 49ers 6–10, Cardinals 5–11) and won the decisive season finale against the Rams (not only by overall record, but by division record, as both teams coming into the game had a 3–2 division record). In the playoffs, the Seahawks won in their first game against the defending Super Bowl XLIV champs, the New Orleans Saints, 41–36. The Seahawks made even more history during the game with Marshawn Lynch's 67-yard run, breaking 9 tackles, to clinch the victory. After the run, the fans reacted so loudly that a small earthquake (a bit above 2 on the Richter Scale) was recorded by seismic equipment around Seattle and was nicknamed the "Beast Quake". The Seahawks lost to the Bears in their second game, 35–24. In the 2013 NFL season, the Seahawks continued their momentum from the previous season, finishing tied with the Denver Broncos for an NFL-best regular season record of 13–3, while earning the NFC's #1 playoff seed. Their 2013 campaign included big wins over the Carolina Panthers, New Orleans Saints, and the San Francisco 49ers. Six Seahawks players were named to the Pro Bowl: Quarterback Russell Wilson, center Max Unger, running back Marshawn Lynch, cornerback Richard Sherman, free safety Earl Thomas, and strong safety Kam Chancellor. However, none of them was able to play in the Pro Bowl, as the Seahawks defeated the New Orleans Saints 23–15 and the San Francisco 49ers 23–17, in the playoffs to advance to Super Bowl XLVIII against the Denver Broncos. On February 2, 2014, the Seahawks won the franchise's only Super Bowl Championship, defeating Denver 43–8. The Seahawks' defense performance in 2013 was acclaimed as one of the best in the Super Bowl era. The following season, Seattle advanced to Super Bowl XLIX, their second consecutive Super Bowl, but they were dethroned of their title by the New England Patriots by a score of 28–24. They got off to a slow start the next year starting 0-2 and 2-4 through 6 games but finished 10-6 on the year clinching a wild card berth. They beat the Minnesota Vikings 10-9 to advance to the divisional round. Against Carolina, they were down 31-0 at halftime before scoring 24 unanswered points. Their comeback attempt fell short and they failed to make the Super Bowl. Most recently, the Seahawks and the San Francisco 49ers have begun to develop a rivalry, starting with the 49ers hiring of coach Jim Harbaugh for the 2011 NFL season. Harbaugh had coached against Seahawks coach Pete Carroll before in college at Stanford and Southern California, respectively. The 49ers won the first contest between the coaches at the NFL level, then proceeded to win a close game at CenturyLink Field to eliminate the Seahawks from playoff contention. 2012 brought a new season and another Seahawks loss, week 7 on NFL Network's Thursday Night Football at Candlestick Park in San Francisco, as they dropped a 13–6 game where the offense failed to score a touchdown and 49ers quarterback Alex Smith did just enough to survive. Week 16 brought a fever anxiety as the Seahawks and 49ers prepared to face off in primetime on NBC Sunday Night Football. The Seahawks entered the game at 9–5, with back-to-back blowouts in which the team scored more than 50 points in games against the Buffalo Bills and Arizona Cardinals. Quickly, the Seahawks imposed their will with a Marshawn Lynch 24-yard touchdown run, two of quarterback Russell Wilson's touchdown passes and a blocked field goal return had the Seahawks lead at halftime 28–6. The Seahawks continued in the second half, eventually winning 42–13 capped off by Seahawks strong safety Kam Chancellor's hit on former 49ers tight end Vernon Davis. The 49ers, however, won the following week, locking up the division title for the second consecutive season. Since rejoining the NFC West, the Seahawks lead the series 18–15 versus the 49ers, including playoffs. Colin Kaepernick and the 49ers lost their first 2013 season matchup against their NFC West rivals 29–3, with the help of Marshawn Lynch's three touchdowns, with the fans setting a new Guinness World Record for the loudest crowd roar at 136.6 dB. However, the Seahawks were defeated 19–17 in their second 2013 game with the 49ers at Candlestick Park. This was largely due to a late game 51-yard run by Frank Gore. In the 2013 NFC Championship Game, the Seahawks defeated the 49ers 23 to 17, thanks to Malcolm Smith's interception, which was tipped by Richard Sherman. This clinched the Seahawks' berth into Super Bowl XLVIII. The Seahawks won every game against the 49ers, including a decisive 43-16 win in CenturyLink Field, until a Robbie Gould overtime field goal in 2018 led to the Seahawks' first loss at Levi's Stadium, 26-23. The Seahawks have developed a rivalry with the Carolina Panthers. The two teams have played each other in the NFL playoffs three times: during the 2005 NFC Championship Game, which Seattle won 34–14; the 2014 NFC Divisional playoffs, which the Seahawks won 31–17; and the 2015 NFC Divisional playoffs, which the Panthers won 31–24. The Seahawks lead the Panthers in the all-time series 9–4. From the 1980s to the 2002 league realignment, the Denver Broncos were a major rival for the Seahawks. With John Elway, the Broncos were one of the best teams in the NFL, going 200–124–1 overall, and were 32–18 against the Seahawks. Since 2002, Seattle has won two of four interconference meetings, and the teams met in Super Bowl XLVIII on February 2, 2014, where the Seahawks won 43–8. During the Seahawks' first ten seasons (1976–85), the team's headquarters was in Kirkland at the southern end of the Lake Washington Shipyard (now Carillon Point), on the shores of Lake Washington. The summer training camps were held across the state at Eastern Washington University in Cheney, southwest of Spokane. When the team's new headquarters across town in Kirkland were completed in 1986, the Seahawks held training camp at home for the next eleven seasons (1986–96), staying in the dormitories of the adjacent Northwest College. In Dennis Erickson's third season as head coach, the team returned to the hotter and more isolated Cheney in 1997, where they held training camp through 2006. In 2007, training camp returned to their Kirkland facility, because of the scheduled China Bowl game that was later canceled. In 2008, the Seahawks held the first three weeks of camp in Kirkland, then moved to the new 19-acre (77,000 m2) Virginia Mason Athletic Center (VMAC) on August 18 for the final week of training camp, where the team has held their training camps since. The new facility, adjacent to Lake Washington in Renton, has four full-size practice fields: three natural grass outdoors and one FieldTurf indoors. When the Seahawks debuted in 1976, the team's logo was a stylized royal blue and forest green osprey's head based on Northwest Coast art. The helmet and pants were silver while the home jerseys were royal blue with white and green sleeve stripes and white numerals and names. The road jersey was white, with white, blue and green sleeve stripes and had blue numerals and names. The socks were blue and had the same green and white striping pattern seen on the blue jerseys. Black shoes were worn for the first four seasons, one of the few NFL teams that did so in the late 1970s, at a time when most teams were wearing white shoes. They would switch to white shoes in 1980. In 1983, coinciding with the arrival of Chuck Knox as head coach, the uniforms were updated slightly. The striping on the arms now incorporated the Seahawks logo, and the TV numbers, previously located on the sleeves, moved onto the shoulders. The helmet facemasks changed from gray to blue. Also, the socks went solid blue at the top, and white on bottom. In the 1985 season, the team wore 10th Anniversary patches on the right side of their pants. It had the Seahawks logo streaking through the number 10. 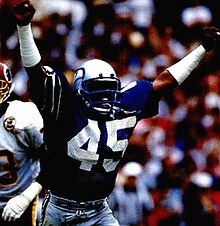 In 1994, the year of the NFL's 75th Anniversary, the Seahawks changed the style of their numbering to something more suitable for the team; Pro Block from then until 2001. That same year, the Seahawks wore a vintage jersey for select games resembling the 1976–82 uniforms. However, the helmet facemasks remained blue. The logos also became sewn on instead of being screen-printed. In 2000, Shaun Alexander's rookie year and Cortez Kennedy's last, the Seattle Seahawks celebrated their 25th Anniversary; the logo was worn on the upper left chest of the jersey. 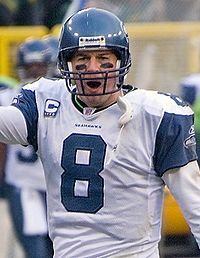 In 2001, the Seahawks switched to the new Reebok uniform system still in their then-current uniforms after that company signed a 10-year deal to be the exclusive uniform supplier to the NFL, but it would be their last in this uniform after the season ended. Prior to this, various companies made the team's uniforms. Seattle Seahawks uniform combinations, 2002–2011. A green alternate jersey was used, but only for one game of the 2009 season. On March 1, 2002, to coincide with the team moving to the NFC as well as the opening of Seahawks Stadium (which would later be renamed Qwest Field, then CenturyLink Field), both the logo and the uniforms were heavily redesigned. The Wordmark was designed by Mark Verlander and the logo was designed by NFL Properties in-house design team. The colors were modified to a lighter "Seahawks Blue", a darker "Seahawks Navy" and lime green piping. The helmets also were changed from silver to the lighter "Seahawks Blue" color after a fan poll was conducted. Silver would not be seen again until 2012. The logo artwork was also subtly altered, with an arched eyebrow and a forward-facing pupil suggesting a more aggressive-looking bird. At first, the team had planned to wear silver helmets at home and blue helmets on the road, but since NFL rules forbid the use of multiple helmets, the team held the fan poll to decide which color helmet would be worn. The team had usually worn all blue at home and all white on the road since 2003, but late in the 2009 season, the Seahawks wore the white jersey-blue pants combo. The blue jersey and white pants combo has been worn for only one regular season game, the 2005 season opener at the Jacksonville Jaguars, while the white jersey and blue pants combination has not been worn regularly since late in the 2002 season, with the exception of late in the 2009 season. In 2009, the Seahawks once again wore the white jersey and blue pants combination for road games against Minnesota (November 22), St. Louis (November 29), Houston (December 13) and Green Bay (December 27). The Seahawks wore their home blue jerseys during Super Bowl XL despite being designated as the visitor, since the Pittsburgh Steelers, the designated home team, elected to wear their white jerseys. Since the Oakland Raiders wore their white jerseys at home for the first time ever in a game against the San Diego Chargers on September 28, 2008, the Seahawks are currently the only NFL team never to have worn their white jerseys at home. 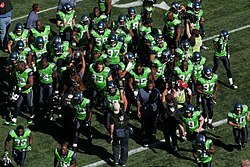 Seahawks players wearing green jerseys in 2009. 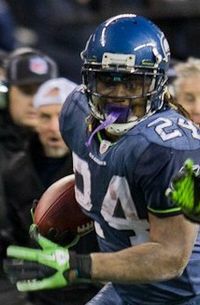 On September 27, 2009, the Seahawks wore lime green jerseys for the first time, paired with new dark navy blue pants in a game against the Chicago Bears. The jerseys matched their new sister team, the expansion Seattle Sounders FC of Major League Soccer who wear green jerseys with blue pants. On December 6, 2009, the Seahawks wore their Seahawks blue jersey with the new dark navy blue pants for the first time, in a game against the San Francisco 49ers. The Seahawks broke out the same combo two weeks later against the Tampa Bay Buccaneers, and two weeks after that in the 2009 regular season finale against the Tennessee Titans. In December 2009, then-coach Jim Mora announced that the new lime green jerseys were being retired because the team did not win in them, because he liked the standard blue home jerseys better, and added that the home jersey is a better match for the navy pants. In the same press conference, he stated that the new navy pants "felt better" on players as opposed to the Seahawks blue pants. For the 2010 season, Seattle returned to the traditional all "Seahawks Blue" at home and all white on the road. 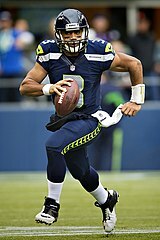 Russell Wilson wearing the current Seahawks home uniform. On April 3, 2012, Nike, which took over as the official uniform supplier for the league from Reebok, unveiled new uniform and logo designs for the Seahawks for the 2012 season. The new designs incorporate a new accent color, "Wolf Grey", and the main colors are "College Navy" and "Action Green". The uniforms incorporate "feather trims", multiple feathers on the crown of the helmet, twelve feathers printed on the neckline and down each pant leg to represent the "12th Man", referring to the team's fans. The Seahawks have three different jersey colors: navy blue, white, and an alternate grey jersey. The Seahawks will have three different pants: navy blue with green feathers, gray with navy blue feathers, and white with navy blue feathers. Their new logo replaces the Seahawk blue with wolf grey. Altogether, there are nine (9) different uniform combinations possible. The Seahawks wore their Nike home blue jerseys for the first regular season game on September 16, 2012 against the Dallas Cowboys. The uniform Marshawn Lynch wore in that game is preserved at the Pro Football Hall of Fame. On September 9, 2012, the Seahawks wore their Nike white away jerseys for the first regular season game against the Arizona Cardinals; on October 14, 2012, with the Carolina Panthers wearing white at home, they wore their blue jerseys with gray pants (and would do so again against the Miami Dolphins seven weeks later); and on December 16, 2012, they wore their Alternate Wolf Grey jerseys for the first time against the Buffalo Bills. As of the end of the 2018 season, the Seattle Seahawks have competed in 43 NFL seasons, dating back to their expansion year of 1976. The team has compiled a 344–331-1 record (16–16 in the playoffs) for a .510 winning percentage (.500 in the playoffs). Seattle has reached the playoffs in 17 separate seasons, including in the 2005 season when they lost Super Bowl XL to the Pittsburgh Steelers, the 2013 season when they defeated the Denver Broncos to win Super Bowl XLVIII, and the 2014 season when they lost Super Bowl XLIX to the New England Patriots. In the 2010 season, the Seahawks became the first team in NFL history to earn a spot in the playoffs with a losing record (7–9, .438) in a full season; this was by virtue of winning the division. The Seahawks would go on to defeat the reigning Super Bowl champion New Orleans Saints in the Wild Card round, becoming the first team ever to win a playoff game with a losing record. Until Week 7 of the 2016 season against the Arizona Cardinals, the Seahawks had never recorded a tied game in their history. The 35th Anniversary team was voted upon by users on Seahawks.com and announced in 2010. Seahawks' retired numbers at CenturyLink Field, including their fans, who have retired as well. 1 Jerry Rice wore No. 80 for his 2004 stint with the Seahawks. According to Rice, the team offered him the jersey number, with Largent's permission. Note: Although Mike McCormack served as head coach, president, and general manager for the Seahawks, he is only listed in the Pro Football Hall of Fame for his contributions as a tackle for the New York Yanks and the Cleveland Browns. Defensive coordinator – Ken Norton Jr. The Seahawks cheerleaders are called the Sea Gals. During the off-season, a select performing group from the Sea Gals travel parades and with other NFL Cheerleaders on the road. "Home of the 12th Man" signage within CenturyLink Field in 2013. The 12th man (also known as the 12s) refers to the fan support of the Seahawks. The team's first home stadium, the Kingdome, was one of the loudest and most disruptive environments in the NFL. Opponents were known to practice with rock music blaring at full blast to prepare for the often painfully high decibel levels generated at games in the Kingdome. In 2002, the Seahawks began playing at what is now CenturyLink Field. Every regular season and playoff game at CenturyLink Field since the 2nd week of the 2003 season has been played before a sellout crowd. Like the Kingdome before it, CenturyLink Field is one of the loudest stadiums in the league. The stadium's partial roof and seating decks trap and amplify the noise and reflect it back down to the field. This noise has caused problems for opposing teams, causing them to commit numerous false-start penalties. From 2002 through 2012, there have been 143 false-start penalties on visiting teams in Seattle, second only to the Minnesota Vikings. The Seahawks' fans have twice set the Guinness World Record for the loudest crowd noise at a sporting event, first on September 15, 2013, registering 136.6 dB during a game against the San Francisco 49ers and again on December 2, 2013, during a Monday Night Football game against the New Orleans Saints, with a roar of 137.6 dB. As of September 29, 2014, the record of 142.2 dB is held in Arrowhead Stadium by fans of the Kansas City Chiefs. A Boeing 747-8F painted in 12th man livery for the team's Super Bowl appearance. Prior to kickoff of each home game, the Seahawks salute their fans by raising a giant #12 flag at the south end of the stadium. Current and former players, coaches, local celebrities, prominent fans, Seattle-area athletes, and former owner Paul Allen have raised the flag. Earlier, the Seahawks retired the #12 jersey on December 15, 1984 as a tribute to their fans. Before their Super Bowl win, the Seahawks ran onto the field under a giant 12th Man flag. In September 1990, Texas A&M filed, and was later granted, a trademark application for the "12th Man" term, based on their continual usage of the term since the 1920s. 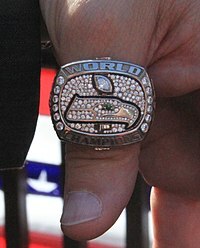 In January 2006, Texas A&M filed suit against the Seattle Seahawks to protect the trademark and in May 2006, the dispute was settled out of court. In the agreement, which expired in 2016, Texas A&M licensed the Seahawks to continue using the phrase, in exchange for a licensing fee, public acknowledgement of A&M's trademark when using the term, a restriction in usage of the term to seven states in the Northwest United States, and a prohibition from selling any "12th Man" merchandise. Once the agreement expired, the Seahawks were allowed to continue using the number "12" but were no longer permitted to use the "12th Man" phrase. In August 2015, the Seahawks decided to drop their signage of the "12th Man" term and shifted towards referring to their fans as the "12s" instead. Starting in the 1998 season, Blitz has been the Seahawks' official mascot. In the 2003 and 2004 seasons, a hawk named Faith would fly around the stadium just before the team came out of the tunnel. However, because of her relative small size and an inability to be trained to lead the team out of a tunnel, Faith was replaced by an augur hawk named Taima before the start of the 2005 season. Taima started leading the team out of the tunnel in September 2006. Beginning in 2004, the Seahawks introduced their drum line, the Blue Thunder. The group plays at every home game as well as over 100 events in the Seattle community. Map of radio affiliates (lower 48 and Canada). Map of radio affiliates (Alaska). As of 2017[update], the Seahawks' flagship station is KIRO (AM) 710 kHz – KIRO-FM 97.3 MHz. 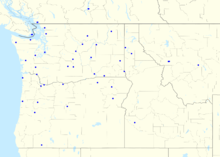 Games are heard on 47 stations in five western states and Canada. Microsoft holds naming rights for the broadcasts for their web search engine under the moniker of the "Bing Radio Network". The current announcers are former Seahawks players Steve Raible (who was the team's color commentator from 1982 to 2003) and Warren Moon. The Raible-Moon regular season pairing has been together since 2004 (during the preseason Moon works for the local television broadcast so the color commentary is split between former Seahawks Paul Moyer, Sam Adkins, and Brock Huard). Pete Gross, who called the games from 1976 until just days before his death from cancer in 1992, is a member of the team's Ring of Honor. Other past announcers include Steve Thomas from 1992 to 1997, Lee Hamilton (also known as "Hacksaw") from 1998 to 1999, and Brian Davis from 2000 to 2003. Preseason games not shown on national networks were produced by Seahawks Broadcasting and televised by KING-TV, channel 5 (and, in 2008, also on sister station KONG-TV since KING, an NBC affiliate, was committed to the Summer Olympics in China). Seahawks Broadcasting is the Emmy Award Winning in-house production and syndication unit for the Seattle Seahawks. Curt Menefee (the host of Fox NFL Sunday) has been the Seahawks TV voice since the 2009 preseason. Since the 2012 season, KCPQ-TV, which airs most of the Seahawks' regular season games (as the Seattle-Tacoma area's Fox affiliate), is the television partner for the team and has replaced KING 5 as broadcaster for preseason games, while simulcasts of any Seahawks games on ESPN's Monday Night Football will air (as of the 2018 season) on CBS affiliate KIRO-TV. In addition, any Saturday or Sunday afternoon games broadcast by CBS (usually--but not always--with the Seahawks hosting an AFC opponent) will air on KIRO-TV. ^ a b The Seattle Seahawks played two preseason and three regular season home games of the 1994 season at Husky Stadium due to repairs at the Kingdome. ^ Farnsworth, Clare (June 4, 2013). "ON THIS DATE: FIRST STEP TOWARD SECURING SEAHAWKS TAKEN". Seahawks.com. NFL Enterprises, LLC. Archived from the original on March 20, 2014. Retrieved October 7, 2018. ^ "Seattle Seahawks Team Capsule" (PDF). 2018 Official National Football League Record and Fact Book. NFL Enterprises, LLC. August 9, 2018. Retrieved October 7, 2018. ^ a b Farnsworth, Clare (April 3, 2012). "Seahawks' new look leaves other players longing". Seahawks.com. NFL Enterprises, LLC. Archived from the original on September 24, 2015. Retrieved April 7, 2018. ^ "Seattle Seahawks Logo Slick" (PDF). SeahawksMedia.com. NFL Properties, LLC. January 4, 2012. Archived from the original (PDF) on March 22, 2016. Retrieved February 1, 2018. ^ "Chuck Arnold Named President Of Seahawks And First & Goal Inc". Seahawks.com. NFL Enterprises, LLC. September 24, 2018. Retrieved October 7, 2018. ^ Farnsworth, Clare (August 25, 2013). "Catching up with: Terry Taylor". Seahawks.com. NFL Enterprises, LLC. Archived from the original on August 27, 2013. Retrieved November 24, 2018. What he did: The Seahawks’ first-round draft choice in 1984 out of Southern Illinois, Terry Taylor started 52 games at cornerback through the 1988 season and then returned in 1994 to start three more in an injury-depleted secondary. Taylor’s 16 career interceptions for the Seahawks rank No. 10 on the franchise’s all-time list and he returned two for touchdowns. He also appeared in the Seahawks’ infamous Locker Room Rock video in 1985. ^ Farnsworth, Clare (July 19, 2014). "On this date: Three home games moved to Husky Stadium". Seahawks.com. NFL Enterprises, LLC. Archived from the original on July 22, 2014. Retrieved October 7, 2018. ^ Gola, Hank (January 9, 2014). "The art of noise in Seattle: Seahawks' 12th man helps create NFL's biggest home-field advantage". New York Daily News. Retrieved February 21, 2014. ^ Narciso, Gerald (January 25, 2014). "Seahawks Mania Bigger Than U.S. Can Contain". The New York Times. Retrieved February 21, 2014. ^ Cimini, Rich (February 3, 2014). "Twelfth Night: Number featured in win". ESPN. Retrieved February 21, 2014. ^ "Seres 'alados' hacen retumbar el MetLife Stadium". mediotiempo.com. February 2, 2014. Retrieved January 19, 2015. ^ Shelton, Don (January 7, 2015). "12th Fan of the Week: Cheering the Seahawks all the way from Chile". The Seattle Times. Retrieved January 29, 2015. ^ Drovetto, Tony (August 16, 2014). "Seahawks Rookies React To Roar of 12s at CenturyLink Field". Seattle Seahawks. Retrieved January 19, 2015. ^ Burnside, Jeff (September 26, 2014). "Seahawks 12s rally for fellow fan in his final days". KOMO-TV. Retrieved January 19, 2015. ^ Horn, Barry (October 9, 2014). "Horn: Seahawks' home fans participators, Cowboys' home fans are spectators". The Dallas Morning News. Retrieved January 19, 2015. ^ a b Wilson, Ryan (September 16, 2013). "Seahawks fans set Guinness World Record for loudest stadium". CBS Sports. Retrieved October 1, 2014. ^ a b Schwab, Frank (December 2, 2013). "Seahawks take back the Guinness World Record for crowd noise at 137.6 decibels". Yahoo! Sports. Retrieved October 1, 2014. ^ a b Drovetto, Tony (December 2, 2013). "Seahawks fan base retakes Guinness World Record for crowd noise". Seattle Seahawks. Archived from the original on September 30, 2014. Retrieved October 1, 2014. ^ Prunty, Brendan (January 26, 2014). "Seahawks' 12th Man draws from all over Pacific Northwest, bringing diverse fan base to Super Bowl". The Star-Ledger. Retrieved March 3, 2014. ^ "NFL History: 1961–1970". Retrieved September 8, 2013. ^ "Look Back". Seattle Post-Intelligencer. June 14, 2006. Retrieved August 10, 2013. ^ "BUCS AND SEAHAWKS JOINED NFL IN '76". Pro Football Hall of Fame. January 1, 2005. Retrieved March 17, 2016. ^ "1976 NFL Expansion Draft – Pro Football Hall of Fame". Pro Football Hall of Fame. February 7, 2010. Retrieved August 10, 2013. ^ "1987 Topps #183 Kenny Easley" (JPG). Topps. Topps Chewing Gum, Inc. 1987. Retrieved November 12, 2017. ^ Kapadia, Sheil (August 5, 2017). "Kenny Easley finally gets closure with Hall of Fame induction". EPSN. ^ "1986 McDonald's Seahawks #45 Kenny Easley" (JPG). McDonald's. McDonald's Corporation. 1986. Retrieved November 12, 2017. ^ "Seattle Seahawks". NFL.com. Retrieved January 19, 2015. ^ "Seahawks history: Ken Behring and when we almost lost the Seattle Seahawks". January 22, 2014. ^ "Top 10 controversial calls". NFL.com. June 3, 2010. Retrieved August 10, 2013. ^ "NFL ref admits mistakes in Super Bowl". ESPN.com. August 7, 2010. Retrieved November 17, 2017. ^ "Seattle Seahawks fire Jim Mora; Pete Carroll courted, sources say". Espn.com. January 9, 2010. Retrieved September 16, 2016. ^ Sandi Doughton; Danny O'Neil (January 10, 2011). "Seahawks fans' frenzy felt by seismometer". The Seattle Times. Retrieved November 12, 2012. ^ Rosenthal, Gregg (February 2, 2014). "Seattle Seahawks stomp Broncos for Super Bowl win". National Football League. Retrieved October 2, 2017. ^ Pompei, Dan (March 6, 2014). "THE BEST DEFENSES IN NFL HISTORY". Sports on Earth. Retrieved September 29, 2014. ^ "Seahawks fans break noise record again; set off seismometer with quake-like shakes". MyNorthwest.com. December 3, 2013. Retrieved January 31, 2015. ^ Tim Keeney. "Seahawks vs. 49ers: Score, Grades and More from NFC Championship Game 2014". Bleacher Report. Retrieved January 19, 2015. ^ "- Pro-Football-Reference.com". Pro-Football-Reference.com. Retrieved January 19, 2015. ^ "Boxscore finder: Seattle Seahawks vs Denver Broncos". Pro-Football-Reference.com. Retrieved January 19, 2015. ^ Stein, Alan J. (February 28, 2018). "Lake Washington Shipyards (Kirkland)". History Link. Retrieved June 24, 2018. ^ José Miguel Romero (August 19, 2008). "Seahawks digging their new digs in Renton". The Seattle Times. Retrieved January 29, 2015. ^ Wright, Robin K. (January 28, 2014). "Burke Blog: Introducing the mask that inspired the Seattle Seahawks logo". Burke Museum of Natural History and Culture. Retrieved January 29, 2015. ^ Yantz, Mickel. "Seahawk Uni History". Retrieved April 29, 2013. ^ Farnsworth, Clare (April 4, 2012). "Seahawks Uniform Timeline". Seattle Seahawks. Retrieved January 29, 2015. ^ Brulia, Tim. "White at Home in the NFL". Uni Watch. Retrieved June 12, 2013. ^ Johns, Greg (December 9, 2009). "Big Seahawks news: Green jerseys retired!". Seattle Post-Intelligencer. Retrieved April 29, 2013. ^ Hanzus, Dan (April 3, 2012). "Nike saves biggest changes for neighboring Seahawks". National Football League. Retrieved August 26, 2015. ^ "New Seahawks uniform preserved". Pro Football Hall of Fame. September 19, 2012. Retrieved April 29, 2013. ^ Farnsworth, Clare (September 17, 2010). "A blue-and-green Dream Team". Seattle Seahawks. Retrieved August 10, 2013. ^ "Seahawks Fans". Seattle Seahawks. Retrieved April 12, 2018. ^ Farnsworth, Clare (October 14, 2012). "One final honor for Cortez". Seattle Seahawks. Archived from the original on August 24, 2017. Retrieved April 12, 2018. ^ Eaton, Nick (October 11, 2012). "Seahawks to retire Cortez Kennedy's jersey number Sunday". Seattle Post-Intelligencer. Retrieved January 29, 2015. ^ Bishop, Greg (October 29, 2004). "Hawks offered No. 80, Rice says". The Seattle Times. Retrieved January 30, 2015. ^ "Sea Gal Official Page". Archived from the original on February 4, 2007. Retrieved February 7, 2007. ^ "Season Tickets". Seattle Seahawks. Retrieved August 10, 2013. ^ Parolin, John (October 10, 2012). "Three-point stance: Seattle Seahawks". ESPN Boston. Retrieved January 31, 2015. ^ "Kansas City Chiefs break Seahawks' loudest stadium record". Sports Illustrated. September 29, 2014. Retrieved October 1, 2014. ^ "Seahawks 12th Man Flag Raisers". Seattle Seahawks. Archived from the original on August 21, 2013. Retrieved January 19, 2015. ^ "Spirit of 12". August 28, 2014. ^ Alicia Jessop (January 31, 2014). "Texas A&M Stands To Earn More in Upcoming 12th Man Trademark Licensing Negotiations As Seahawks' Exposure Rises". Forbes. Retrieved January 19, 2015. ^ "Texas A&M Foundation". giving.tamu.edu. ^ Cassuto, Dan (January 10, 2015). "Seahawks must pay rent to use the phrase '12th Man'". KING 5 News. Retrieved January 29, 2015. ^ Daniels, Chris (August 14, 2015). "CenturyLink Field no longer 'Home of the 12th Man'". KING 5 News. Retrieved August 15, 2015. ^ Danny O'Neil (September 1, 2006). "First hawk out of the tunnel". The Seattle Times. Retrieved June 21, 2007. ^ "Seahawks to partner with Q13 FOX on Seahawks preseason games". Seattle Seahawks. March 29, 2012. Retrieved March 29, 2012. ^ "Radio Network". July 1, 2014. Wikimedia Commons has media related to Seattle Seahawks.